Schizoid personality disorder is a psychiatric condition in which a person has a lifelong pattern of indifference to others and social isolation. The causes of schizoid personality disorder are unknown. This disorder may be related to schizophrenia and it shares many of the same risk factors. 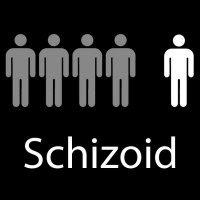 However, schizoid personality disorder is not as disabling as schizophrenia. It does not cause hallucinations, delusions, or the complete disconnection from reality that occurs in untreated or treatment-resistant schizophrenia.